Citation: C N Trueman "Elizabeth I and Finances"
When Elizabeth I came to the throne in 1558, she inherited a difficult financial situation and a debt of £227,000. Over £100,000 of this was owed to the Antwerp Exchange who charged an interest rate of 14%. Throughout her reign, Elizabeth was engaged in expensive financial issues, especially foreign policy. By instinct, Elizabeth was a careful spender and believed in strict housekeeping. However, she could not avoid certain European dimensions that cost large sums of money. To her credit, when Elizabeth died in 1603, the nation was only in debt to the tune of £350,000 – £123,000 more than in 1558, but spread over the duration of her reign, this represented just under £3,000 a year. At first glance this seems to have been a remarkable achievement in an era of much European intrigue. However, the one thing Elizabeth failed to do was to address the whole mechanism of finance and the financial structure of England. This remained essentially unreformed and did not bode well for the reign of James I. While Elizabeth tried to be a careful housekeeper, she was also willing to borrow money of this was required. At the start of her reign she was advised by Thomas Gresham. He made it clear at the start of her reign that Elizabeth’s father, Henry VIII, had not had a good credit rating among European money lenders because of his habit of debasing coins. Gresham also advised Elizabeth that England’s monetary and financial system was being hampered by out-of-date legislation. In 1560, he urged Lord Burghley, William Cecil, to reform this so that the market would grow internally so that if the Queen needed to borrow money she could do so from within the nation as opposed to going abroad for loans. Gresham believed that it would appear unseemly for a Queen of England to go cap in hand to money lenders in Europe and that it would dilute her standing. However, this would not be the case if the matter was dealt with internally. At first, Cecil did not take on board Gresham’s advice, probably because he was conservative by nature when it came to matters of money. However, in 1571 a start was made at reforming the usury laws, which Gresham believed was needed as a starting point of internal financial modernisation. Elizabeth was well aware that her reputation in Europe would be damaged if she had bad credit. Therefore Elizabeth raised as many loans as she could at home. This meant that those who loaned money could be more easily controlled and news of such loans would be restricted. Failure to offer a loan when it was needed for “national interests” would have been deemed as unpatriotic. While Elizabeth may have been careful with money, any chance of a long-term improvement in England’s financial situation was threatened by the lack of any important financial reforms. Elizabeth did not support the idea of raising taxes, as she feared that this would alienate those who she wanted to support her. But wars cost money and the war with Spain in 1585 reduced Elizabeth to borrowing again. Parliament also granted money to the Queen. Local gentry collected this at a local level and few believe that the actual sum collected in a locality was the actual sum that was sent to London. The rich were also allowed to assess their own contribution and it was an accepted fact that the money they gave was not proportionate to their wealth. However, these were the men that Elizabeth needed on her side so nothing was done to correct this anomaly. One way of coping with this was for the Queen to have an efficient bureaucracy – and this was something she did not have. England and Wales still suffered from natural disasters. 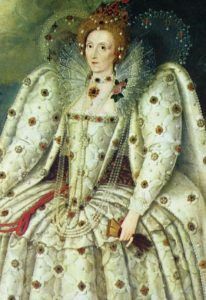 A series of poor harvests in the 1590’s had a negative impact of the nation’s economy and Elizabeth had to borrow from financiers such as Palavicino. In 1600, the Crown estimated its expenditure in both domestic and foreign affairs to be £459,840. The main issue that absorbed the majority of this sum was Ireland (£320,000). England’s contribution in the Low Countries only came to £25,000. However, the Queen’s income for 1600 was estimated at £374,000 – a shortfall of £86,000. There were a few – such as members of the Merchant Adventurers – who did very well during Elizabeth’s reign. But it was also these men who tended to stifle any chance of fiscal reform as they did so well out of the system as it stood. Those who really suffered from the financial problems of Elizabeth’s reign were the poor. During Elizabeth’s reign the price of food went up by about 75% – yet there was a drastic fall in the wages of agricultural labourers during the same period. Those with work found that they could barely afford food, while those out of work could not. Their plight was so extreme that Shakespeare commented on this in ‘A Midsummer Night’s Dream’.